That’s my kind of breakfast! 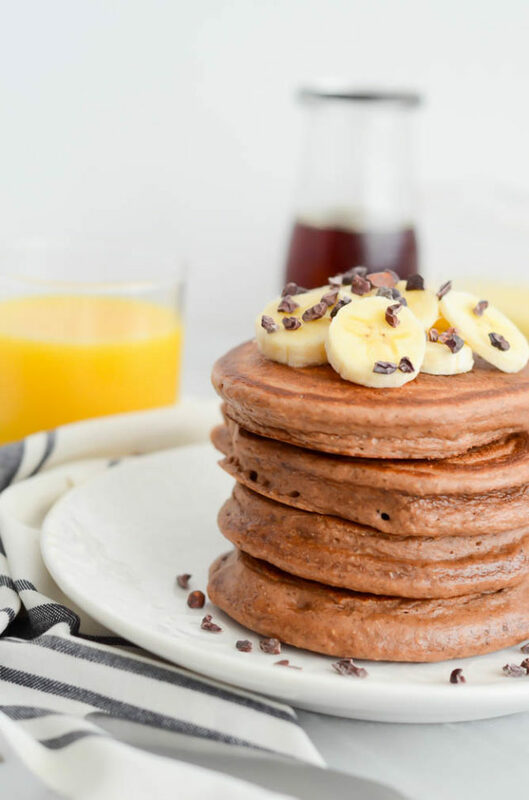 And after such an action- (and food-) packed day like yesterday, these Maca Chia Cocoa Protein Pancakes are exactly what we need to get us going on an even tougher Monday morning than usual. You feel me? We had a great time watching the Super Bowl yesterday, but as we weren’t really cheering for either of the teams, let’s be honest, we really just showed up for the food. The rest of the weekend was spent enjoying a little break in the rain and getting outside for some beach volleyball, and a fun photo shoot with one of my new clients that I’m doing some social media work for. We also spent some time recovering from partying all last week at the Santa Barbara International Film Festival, which is a huge annual event for us thanks to the hubs’ hookup with VIP tickets. Highlights included seeing the world premiere of the film “Charged” (which is amazing, BTW, so inspiring – stay tuned for more on that one) and rubbing elbows with Denzel Washington who was given the Maltin Modern Master Award for his lifetime of achievements both on the stage and in front of the camera. We always have such a blast every year and, although it goes by way too fast, we always find ourselves ready for a good deal of extra shut-eye when all is said and done. 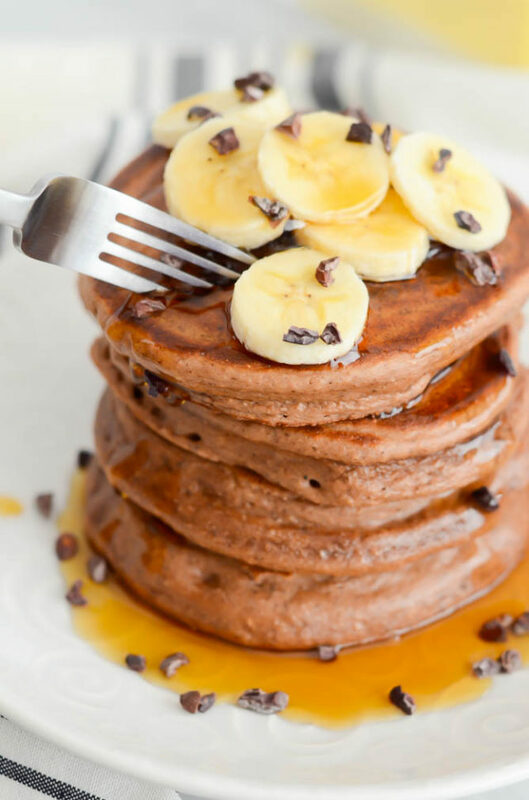 All the more reason for these Maca Chia Cocoa Protein Pancakes to come into our lives! 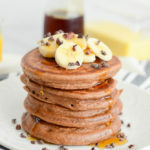 I realize I have not yet posted a pancake recipe here on the blog, although if you’ve checked out my eBook, you’ll know that I have a couple of tasty recipes for more standard, “go-to” pancakes. I also realize that we are now officially into the second month of the year, which means most folks are still TRYING to hold onto their New Year’s resolutions but are finding their strength is waning. I mean, how can it not be with all of these Valentine’s ads and displays floating around? Well, I have good news for you folks! 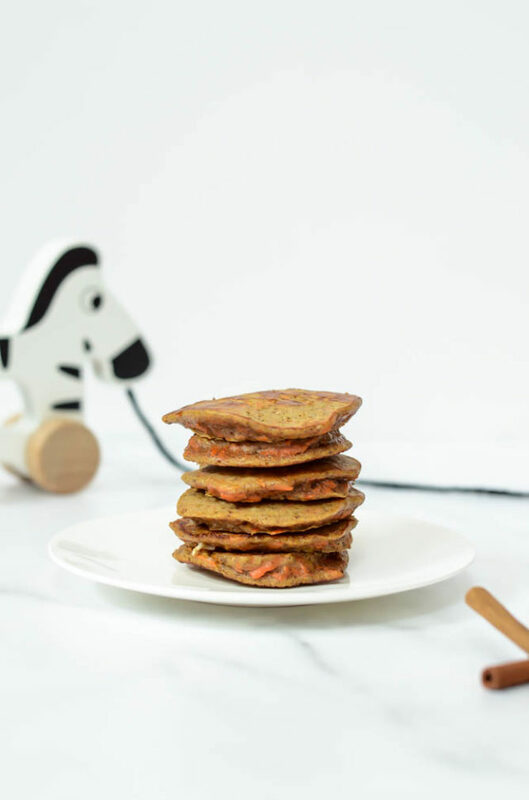 These Maca Chia Cocoa Protein Pancakes are chock full of superfoods, yet can still easily pass as dessert (or just a not-so-savory breakfast if that’s more your jam.) You know I’m all about that balance, and this recipe is practically the epitome of what I preach. Oh, and did I mention they’re also gluten-free? I don’t purposely try to avoid gluten in my recipes (sorry for all of my gluten-intolerants out there,) but just as some of my recipes accidentally turn out vegan, some also just HAPPEN to turn out gluten-free. Just be sure to use gluten-free oats in the batter and you’ll be golden! Alright kids, no more excuses. Let’s bust out our fancy blender and get to it. That’s right, I said blender. 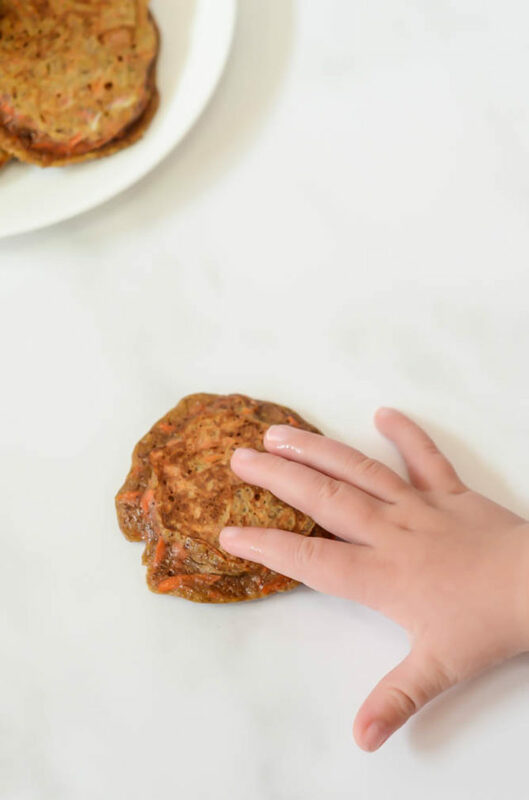 Because that’s the only thing you’ll need to whip up this recipe, aside from your nonstick skillet or griddle, of course. Seriously, the process of this pancake batter could not be any easier. Just throw all of the ingredients in the blender, give it a good whir, and you’re ready to pour said batter into your piping hot cooking vessel. Sound easy enough? 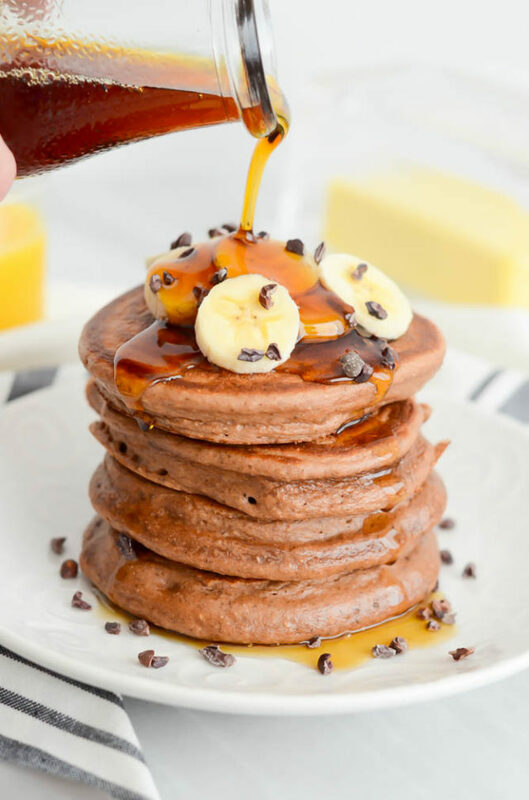 Now, we all know that a Maca Chia Cocoa Protein Pancake’s story can’t stop once it comes off the griddle, because isn’t a pancake breakfast all about the toppings? Yesssirreee. I opted for sliced banana, cacao nibs and high-grade maple syrup for mine, but feel free to use whatever you want! Whipped cream, butter, peanut butter and strawberries are just a few more things that come to mind. So there you have it folks! The secret to a healthy, balanced breakfast that still tastes like dessert. Now can we agree that this Monday isn’t going to be all that bad? 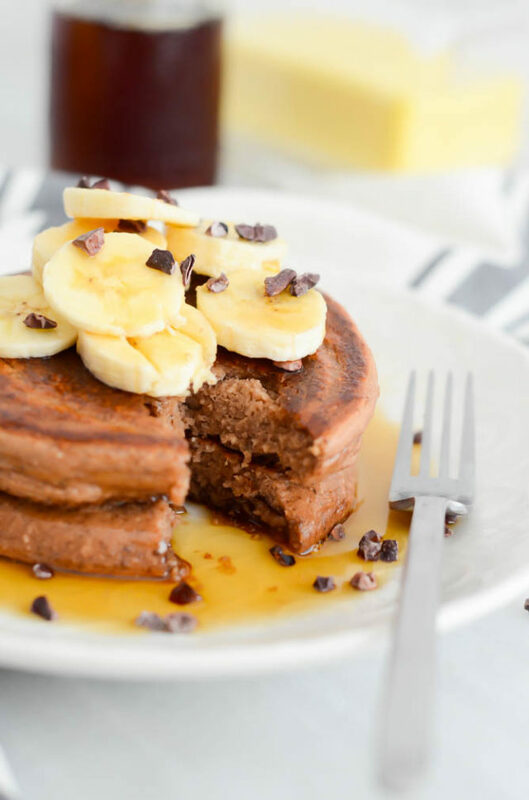 These chocolate pancakes are full of healthy superfoods, yet still taste incredibly indulgent. 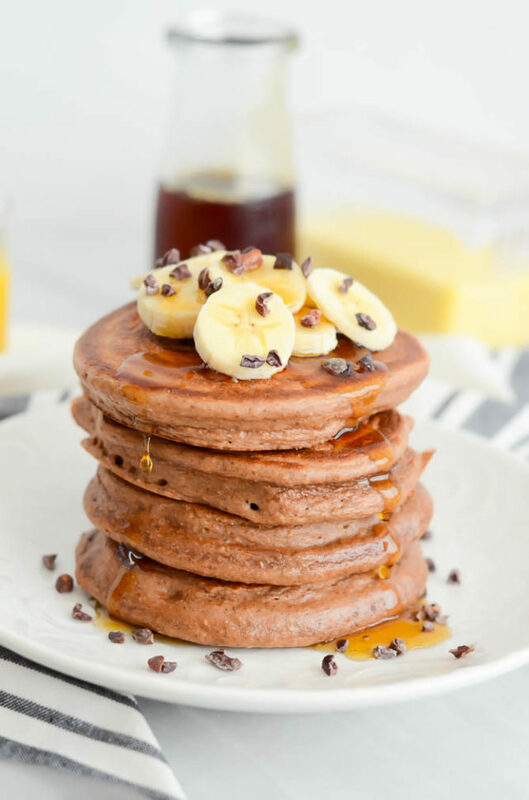 The perfect breakfast for any day of the week! Begin heating a nonstick skillet or griddle over medium-high heat. Combine all ingredients in a high-powered blender. Using a quarter cup measure, scoop pancake batter onto heated pan. Cook for 2-3 minutes on each side, or until it gets a nice golden color. Remove from pan to a heated plate and continue cooking the rest of the batter. Top with whatever you prefer! Some ideas are: sliced bananas, sliced strawberries, maple syrup, peanut butter, cacao nibs, shredded coconut and whipped cream.